You are welcome to join my eBook affiliate program to help boost your income - it's easy to set up, just follow the directions provided below. You receive 50% commission on every sale you make. The eBook is a How To Sketch guide written in a friendly style with a simple format and is sure to prove popular with your visitors. I do all the selling on my eBook sales page. All you have to do is link to that page with your personal Clickbank code. A text link example is provided for you below. You need a Clickbank Account, it's free to join. Click here if you're already a Clickbank Affiliate. If not, please go to step 2. Create a secure Hoplink by searching for and selecting the How To Sketch ebook after you're signed into the "Marketplace" at Clickbank and then click on "Promote". The first box is for your nickname. The second box is an optional tracking ID (for your records only) if you sell more than one type of book. For example, you may put "HTS" as a tracking ID for the "How To Sketch" book. Once you've filled in the boxes, press Create. The new window shows you 2 boxes. The 2nd box contains a link that is all set up ready to use on your website. Now that you are a member of Clickbank, you can now participate in my ebook affiliate program, congratulations! There are so many different ways to promote your hoplink including via your website, newsletters or emails. See below for some resources to help get you started. If you are already an affiliate with Clickbank, you can create your link now. Important: Replace YOU with the 'nickname' you established with Clickbank. I recommend you create a hoplink inside the Clickbank website because it is encrypted and more secure than the example format shown above. 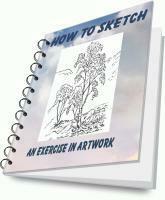 The How To Sketch eBook is a simple guide that gently steers you towards sketching with a confident stroke. Get Your How To Sketch Guide Now! Don't forget to use your own affiliate code in the links, these are just examples. Ok, you're set, now Promote Your Link and Earn Commissions! As an affiliate, you have my permission to copy any of the text, images or testimonials from the eBook sales page on www.allaboutdrawings.com. Clickbank is a secure, reliable company that handles the sales and payment processing for affiliates. There are simple instructions for you to follow which allow you to create a unique link and html code to track your referrals and ensure that you are paid affiliate commissions. Clickbank pay affiliates by EFT, Check or Paypal, it's your choice. Clickbank is an excellent company - the largest online distributor of electronic products - and they are very well regarded in the Internet Community. Clickbank pays affiliates up to twice a month once a payment threshold is met. Click here for more information on affiliate payments. Click here to read Clickbank's privacy policies. Disclaimer: Clickbank has an Anti-Spam Policy and affiliates who promote my product through illegal or unethical techniques, may have their affiliate account terminated by Clickbank. The best tip I can give you to be a successful affiliate is to personally review the How To Sketch book and write a recommendation with your thoughts. You have visitors who follow your site and trust you, so honesty sells in my opinion. A great way to generate more sales is by sending out emails and giving genuine feedback about the book's benefits. Use your unique 'Clickbank hoplink' within the email and that will take visitors straight to the sales page. I love seeing people succeed so I wish you all the very best and I hope you reach your goals once you've joined this amazing ebook affiliate program.